I know I have been ranting lately about the cost of things–my Lupron shots (thousands of dollars) and my daughter’s school year book ($70). So I thought I’d take a step back and stop ranting about how expensive things are. Now I have a rant about how cheap something is. That something is a shot of Botox! 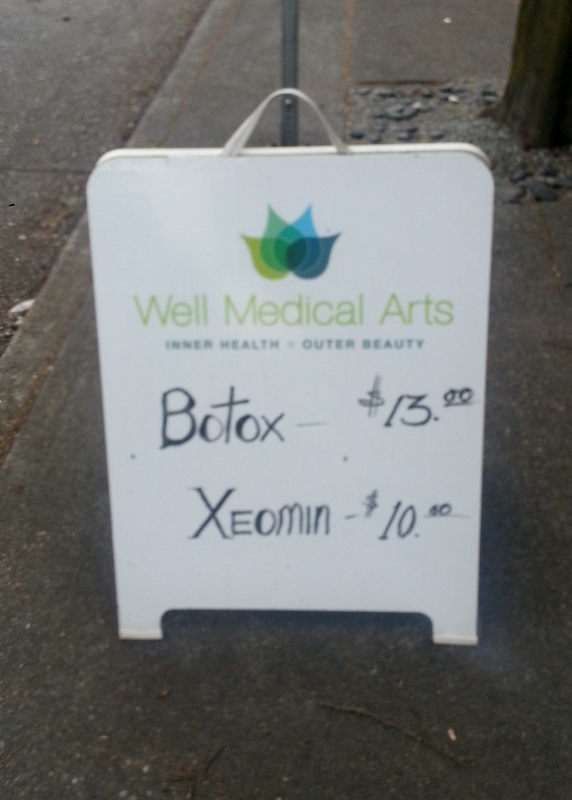 I passed a sign in my neighborhood advertising for $13 Botox injections!?!?! Okay, wait a minute. Their website says “$13/unit.” I imagine that if you only need one unit, you don’t really have a use for Botox. Order has been restored to my mind. Brings an image of a discounted plastic look face!!!! Yikes, that would not be pretty. I’m looking for that $5.00 shot of Lupron! Come on, Scorchy! You know that friendly guy on the box doesn’t give his smiles away for free! I knew there must be a catch. A unit probably takes care of the beginning of a line in your forehead! Yep, no mother/daughter Botox treatments for us!